Some say that great creations never truly age, and six years is a lot in terms of videogames. In Skyrim’s case, the latest on a long-running series of ports and remasters, is a great version of the venerable fifth entry to The Elder Scrolls franchise, now on the go for the first time ever, thanks to the Nintendo Switch. While it isn’t revolutionary or different in any way in comparison to any of the previous releases, Skyrim on the Switch is still an impressive achievement, considering the size, scope and complexity of the world in which the game takes place in. That’s not mentioning the fact that all of the DLC is included from the get-go, so there’s even swampy Morrowind to explore alongside the massive frozen continent home to the Stormcloaks and most importantly, dragons. Ah, I forgot everybody says those have been dead for centuries. My bad. Since I’ve already spent hours upon hours hacking, slashing, shooting, flying and sneaking my way through a few of The Elder Scrolls games on PC over the years, I’ve come to expect a certain level of bugs to pop in from time to time while playing. Things like enemy dead bodies behaving erratically, items shifting from place to place, and the rest of the crazy physics engine issues that always seem to pop up. None of these were ever cause to quit playing these games, and in that regard, this Switch version of Skyrim is ever as faithful. It’s an incredibly rich, open-ended adventure that’s as fantastic as any of Bethesda’s open world games. You can be a posh mage and study all of the books you can find in the world, or be a dumb grunt and beat everyone senseless, or better yet, steal all of its treasures and keep them in your mansion estate for yourself. There are no wrong ways to play Skyrim and that’s what still makes it so great, and one of the most streamed games, with hours upon hours of videos all over YouTube, Twitch, you name it. The visual compromises are not nearly as severe as the ones seen in the Doom port, which is to be expected, since this is a much older game than id’s. While it doesn’t look as sharp as the remastered edition that was put out last year on PC and the current gen consoles, it’s not that far behind. Environmental effects are still present and are still quite impressive, even more so while playing the game in portable mode. Clumps of grass move along with the wind, fireballs illuminate the way as they fly through a dark cave, and character models look creepy enough to make you want to stuff their heads into helmets as they’ve always looked. In terms of Switch-only features, aside from the obvious benefit of being able to play in both handheld and docked modes, you’ve also able to make use of some motion controls, like aiming bows, swinging swords and even lock picking. Swordfighting is as waggle-heavy as any game with such controls on the Wii, but there are benefits to using it to aim a bow if you’re not into relying on the Switch’s less than ideal analog sticks. I’m not particularly in love with using motion controls even for picking locks, but it’s an interesting application nonetheless, especially considering how much of a fuss Nintendo made about the positional rumble motors inside the Switch’s joycons. Thankfully, there’s also the option of leaving all of these off, and that’s how I’ve been playing and thoroughly enjoying the game. 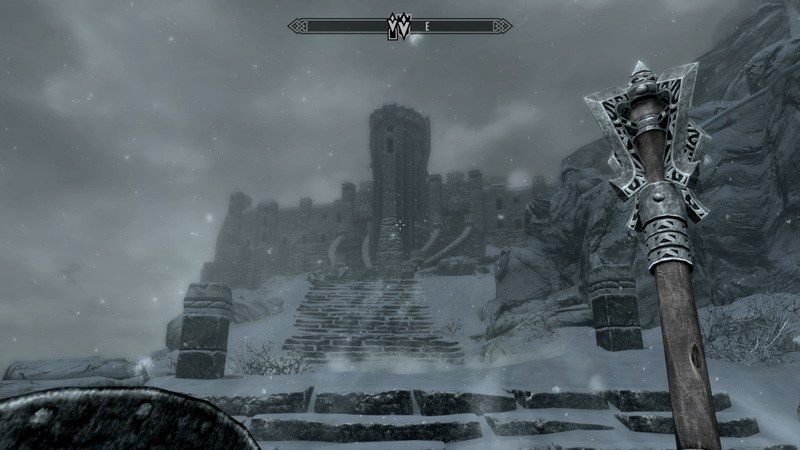 If you were looking for another epic medieval adventure to sink your teeth into after being done with Zelda: Breath of the Wild, it goes without saying that Skyrim is an solid and worthwhile game, even more so considering just how well it made the transition to a portable system. 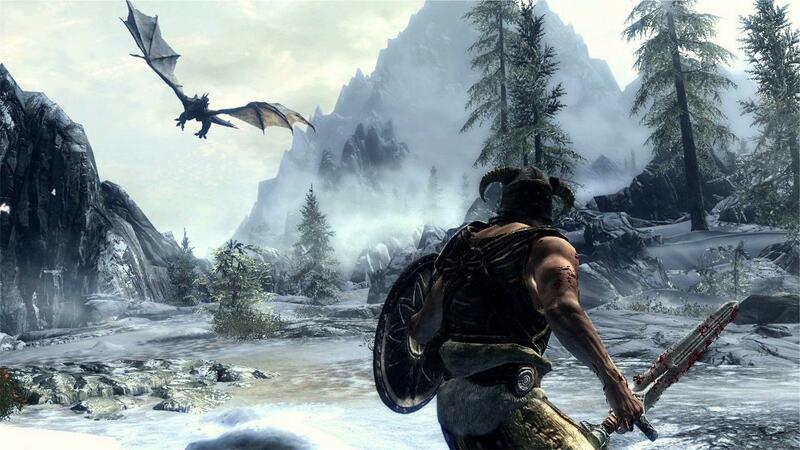 If you haven’t played through the entire thing on any of the other systems it’s been put out on, there’s no better time to dive in and be a Dragonborn. And even if you have, hell, there’s no beating the feeling of Fin Fah Fooing anywhere you can take your Switch and its AC adapter to.